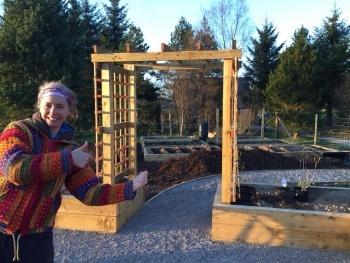 I am pleased to say that after much hard work (and some help from a local landscape gardener), the veg garden and seating area is almost done! Now, to be honest, this will be private space for our own use going forward. But we plan to make the veg and fruit available for our guests. This will be in exchange for a wee donation which will go towards a local animal sanctuary. This area used to be very boggy, overgrown and uneven. Much drainage work has gone in to make it less wet. The digger has done a great job in levelling it off. And instead of being overgrown, it’s now a landscaped secure garden area. Secure to keep the deer out, and the dogs in while I’m working in there! In the four veg plots, I am trying to grow a variety of veg. This include potatoes, onions, leeks, kohl rabi, different lettuces, celeriac, carrots, round cabbage, chard, broad bean, beetroot and spinach. It’s quite exposed and windy up on our hill so we’ll have to see how it goes. 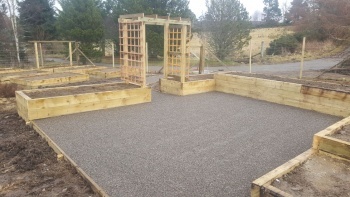 The seating and surrounding area is still being planted but already has an array of herbaceous perennials, azaleas and heathers. We’ve got some honeysuckle and clematis along the pergola too, and some hardy roses. Fruit bushes include cranberry, redcurrant, blackberry and gooseberry. From what used to be a mess, this is a beautiful area now, taking in those stunning views that we are so lucky to have. 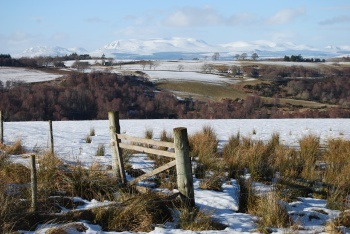 No, that’s not the garden or the landscape going green – we’re still covered in snow! 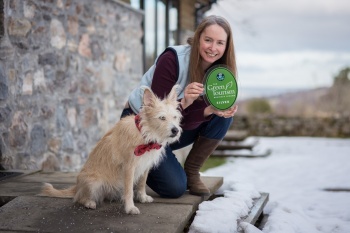 This is Pinewood Steading being acknowledged by Green Tourism with a Silver Award. This demonstrates our commitment and efforts to building a green and sustainable business. Green Tourism is the largest and most established sustainable certification programme in the world. We went through a thorough process to get certified. Green Tourism exists to help tourism businesses ensure their long-term viability, both environmentally and economically. And to help holiday makers make clear ethical, sustainable and responsible decisions about where to holiday or visit. And this is just the start of our journey! We’ve been implementing lots of new ideas to help us, and our guests, help Pinewood Steading to be eco-friendly. We are very passionate about helping the environment we live in. Everything from minimising waste, to being efficient, and respecting our environment. Check out our new page for our green credentials. Here’s to going for Gold! There’s no getting cold during our Highland winters now! We have underfloor heating throughout the Steading which is great, especially on your feet. But we decided we needed something special for those particularly cold nights. So we got a fantastic wood burning stove installed! The wonderful team from Great Glen Stoves came and worked their magic. We are really pleased with it and hope you like the end result. We will provide a starter pack of firelighters, kindling and wood. Guests can purchase more at cost price ensuring they have easy access to the wood they need. The stove is also kept in good order if the right wood is used. Nothing better than to come in after a day out in the hills, or visiting castles, then settling down in front of a warm fire – and perhaps with a dram or two? !